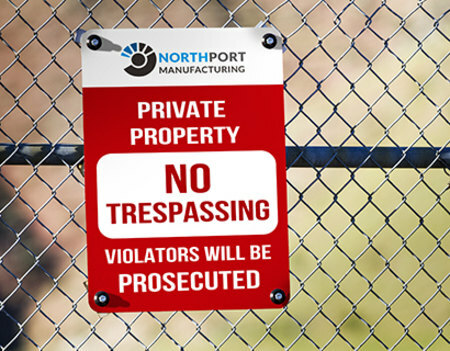 Deter trespassers and display important rules to visitors within your property. Available in standard sizes such as 24" x 18"
Property signs are essential to the security of your company’s grounds. Our property sign printing services ensure a warning and rule is clearly seen at a distance. Aluminum that doesn’t rust and lasts a minimum of five years. It’s also available in reflective aluminum for signs that require that extra color pop. Corrugated plastic is waterproof and comes with UV protection for long-lasting outdoor use. Available in 3 standard property sign sizes, with 36" x 24" as the largest and 24" x 18" in medium dimension. Upload your design and we can have your property sign printing ready in 3 business days. Use our property sign layout templates to ensure your artwork is sized and formatted correctly. PrintPlace layout templates can be downloaded for each standard size label below, in an EPS, PDF, or JPG format for Illustrator or Photoshop.